Hi, I'm a web and application developer from England and I started playing Facebook games in 2009. I started playing Farm Town and now I also play FarmVille, FarmVille 2, Family Farm and many other Zynga and Facebook games. I started using auto clickers to make the games even more enjoyable... until the free ones I used were eventually found to contain a virus! After the virus's being found and having experience playing Facebook games, I had the idea for The eFarmer Tool. I wanted to develop an auto clicker that was safe for players, was easier to use, was portable, had a nice interface, took care of all the clicking and offered users quick and efficient support if they needed it, which are all things other auto clickers lack. The popularity of the eFarmer Tool has really grown over the last year thanks to the eFarmer Tool users. The eFarmer Tool has received some great positive feedback. The tool has even changed the life of some players who were considering having to give up gaming due to the repetitive clicking and ailments such as arthritis, repetitive strain injury and carpel tunnel syndrome. The eFarmer Tool has allowed them to carry on doing something we enjoy, which gives me a great feeling inside! 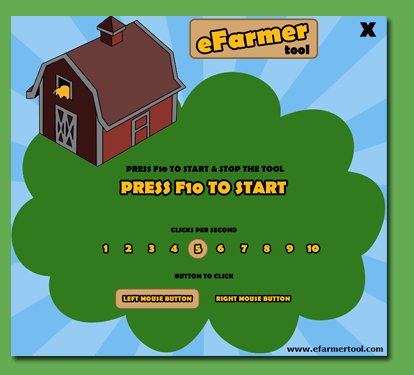 The eFarmer Tool has grown to include a version for Windows and for Mac, it's own YouTube channel showcasing the tool in use, a Twitter account, a Facebook fan page and also an eFarmer Tool user account for becoming neighbours in games. A list of games that the eFarmer Tool makes even more fun to play! A Farm Tale FarmVilla 2 and many, many more!